Merrimack pushed its winning streak to three games after a 2-0-0 week that saw the Warriors claim a Tuesday night victory at Michigan and topple league-foe UConn on Saturday. 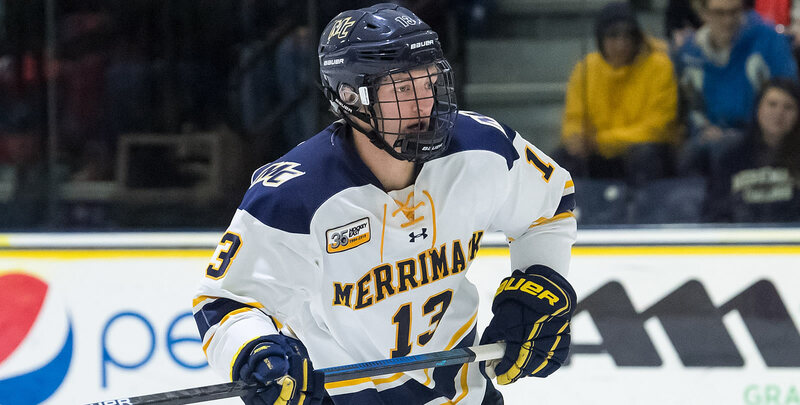 Merrimack rookie Chase Gresock (Powell, Ohio) lead the Warriors with five points (2g, 3a), tying for the league lead among all players last week. He enjoyed a career-best three points (1g, 2a) at Michigan, scoring the game-winning goal before setting up the winner Saturday against UConn. He has now factored in on each game-winning goal during Merrimack's three-game winning streak (2g, 1a). 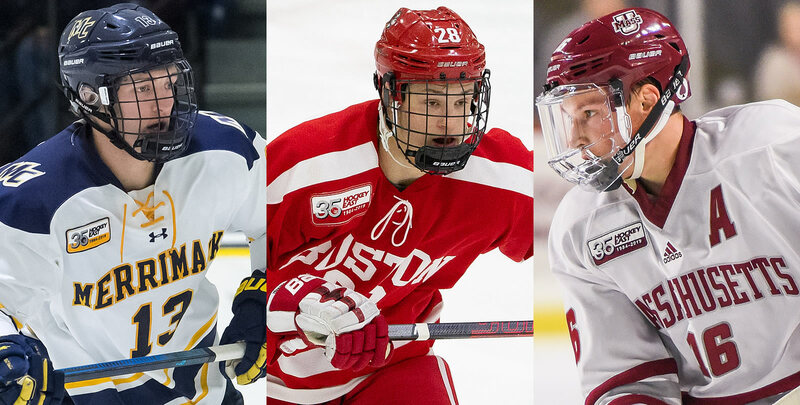 Boston University skated to a 2-2 draw at Harvard Tuesday evening before rolling to a 2-0- 0 weekend in league play, downing #7 Providence and red-hot New Hampshire. Shane Bowers (Halifax, N.S.) potted two goals in a 4-3 road win over the seventh-ranked Friars on Saturday and chipped in with a helper in Friday's 5-2 win over the Wildcats. 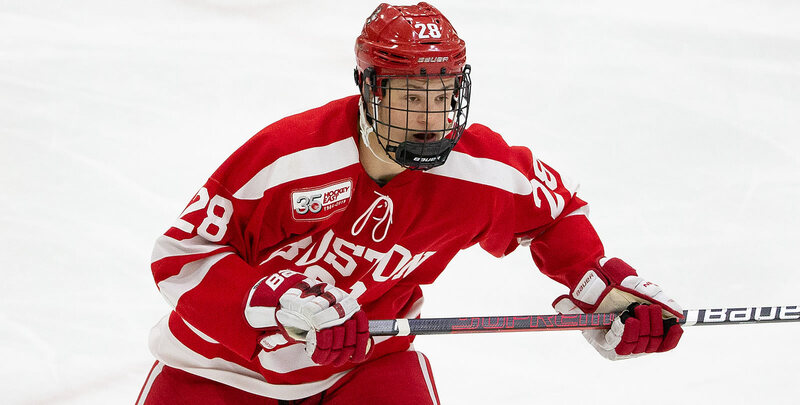 Freshman Joel Farabee (Cicero, N.Y.) registered five points (2g, 3a) for the Terriers and netted the game-tying goal in the Harvard stalemate on Tuesday before scoring the game-winning strike and two assists in a 5-2 win against UNH. Matt Murray (St. Albert, Alta.) earned a pair of wins for #2 Massachusetts over Vermont, improving to 14-1-0 on the year and helping the Minutemen retain first place in the Army ROTC Hockey East Standings. Cale Makar (Calgary, Alta.) enjoyed a four-point (2g, 2a) outing on Saturday, tying his career-high. He factored in on four of UMass' five goals in the win and anchored a defense that allowed just two goals and 43 shots on net in two games. On Saturday, the Minutemen matched their win total from last season (17) and in Hockey East play (9). Northeastern saw two wins at Maine in the first competitions since regaining both Tyler Madden (Deerfield Beach, Fla.) and Cayden Primeau (Voorhees, N.J.) after their stint with Team USA at the World Junior Championship. Madden dished out three helpers while Primeau earned his third shutout of the year on Saturday with 33 saves. Boston College split a weekend in conference play, taking a 4-2 win at home over #7 Providence on Friday before falling to New Hampshire, 6-4, on Saturday. Christopher Brown (Bloomfield Hills, Mich.) scored Friday and picked up two points (1g, 1a) in the first period at UNH on Saturday. He also won 71% of his faceoffs on the weekend. Angus Crookshank (North Vancouver, B.C.) posted one goal and two assists in New Hampshire's 1-1-0 weekend. He extended his point streak to eight games (5g, 7a) and his 18 points in Hockey East play this year are tied for second among all freshmen. UMass Lowell swept a two-game series at Colgate, improving to 9-3-0 on the road this year. Senior goalie Christoffer Hernberg (Espoo, Finland) made 25 saves for the River Hawks in a 3-0 win on Friday, his second shutout of the year. Chase Gresock (Fr., F; Powell, Ohio) lead the Warriors with five points (2g, 3a), tying for the league lead among all players last week. He enjoyed a career-best three points (1g, 2a) in a 4-2 road win at Michigan, scoring the game-winning goal before setting up the winner Saturday against UConn. He has now factored in on each game-winning goal during Merrimack's threegame winning streak (2g, 1a). Joel Farabee (Fr., F; Cicero, N.Y.) registered five points (2g, 3a) as he helped Boston University take a 2-0-1 record last week. He netted the game-tying goal in a 2-2 draw at Harvard on Tuesday and then scored the game-winning strike and two assists in a 5-2 win against UNH. Cale Makar (So., D; Calgary, Alta.) helped Massachusetts complete a two-game sweep of Vermont with a four-point (2g, 2a) outing on Saturday, tying his career-high. 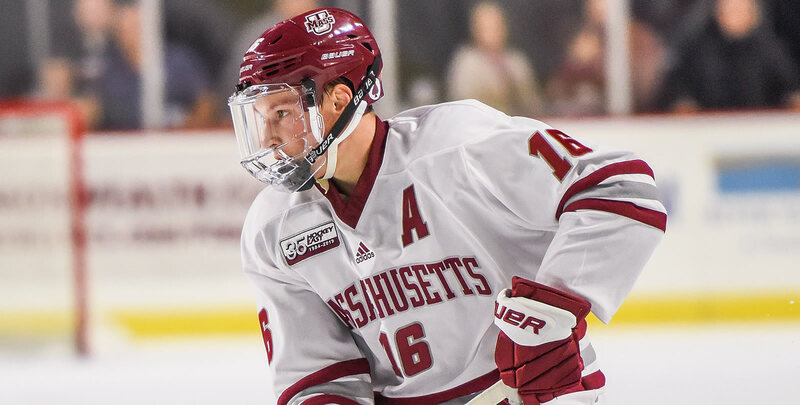 He factored in on four of UMass' five goals in the win and helped anchor a defense that allowed just two goals and 43 shots on net in two games. On Saturday, the Minutemen matched their win total from last season (17) and in Hockey East play (9), while Makar's play has helped classmate Matt Murray (St. Albert, Alta.) off to a 14-1-0 start in net. Christopher Brown, BC (Sr., F; Bloomfield Hills, Mich.) Scored in a 4-2 win against #7 Providence on Friday and picked up two points (1g, 1a) in the first period at UNH on Saturday. He also won 71% of his faceoffs on the weekend. Oliver Wahlstrom, BC (Fr., F: Quincy, Mass.) Netted a goal and had an assist in the opening frame at New Hampshire on Saturday. Shane Bowers, BU (So., F; Halifax, N.S.) Potted two goals in a 4-3 road win over #7 Providence on Saturday and chipped in with a helper in Friday's 5-2 win over New Hampshire. Dante Fabbro, BU (Jr., D; New West Minster, B.C.) Totaled four points (1g, 3a) and a plus-four rating in two league wins last weekend. He tied his career high of three points (1g, 2a) on Friday at UNH and added another helper on Saturday. Matt Murray, UMass (So., G; St. Alberta, Alta.) Improved to 14-1-0 on the year with two victories over Vermont, posting a 1.01 goals against average and .953 save percentage across the two games, making 41 stops on 43 shots. Saturday marked his 23rd career win in just 39 career games, tying Jonathan Quick's program record for victories in 15 fewer contests. Derek Petti, MC (Sr., F; Tewksbury, Mass.) Finished with four points in two games last week, scoring a goal and adding and assist in each tilt to help the Warriors to a 2-0-0 record. He set up the decisive tally Saturday against UConn. He finished plus-three and had six shots on net. Dominic Dockery, MC (So., D; Lockport, N.Y.) Blocked eight shots to add to his league-leading total of 49 on the year to help the Warriors earn two wins last week. He also added an assist in Saturday's home win over UConn. Liam Blackburn, UNH (Jr., F; Prince George, B.C.) Scored three goals for the Wildcats in a 1-1-0 weekend, helping New Hampshire to a 6-4 win over Boston College to mark the first Wildcat win over the Eagles in six years. Angus Crookshank, UNH (Fr., F; North Vancouver, B.C.) Posted one goal and two assists in New Hampshire's 1-1-0 weekend. He extended his point streak to eight games (5g, 7a) over the weekend and his 18 points in Hockey East play this year are tied for second among all freshmen. Brandon Hawkins, NU (Sr., F; Macomb Township, Mich.) Scored three goals on 10 shots on net, helping Northeastern to a pair of wins at Maine. He struck while the Huskies were on the power play on Saturday night. Tyler Madden, NU (Fr., F; Deerfield Beach, Fla.) Dished out three helpers in a pair of Northeastern wins at Maine as the rookie forward returned to the Husky lineup for the first time after competing at the World Junior Championship. He pushed his point streak to five games (2g, 7a) in the process. Cayden Primeau, NU (So., G; Voorhees, N.J.) Earned a 2-0-0 record, 1.00 GAA and .963 save percentage in his return to the NU lineup after backstopping Team USA to a silver medal at the World Junior Championship. He stopped 33 saves on Saturday in his third shutout of the year. Josh Wilkins, PC (Jr., F; Raleigh, N.C.) Registered two goals over the weekend in a series with Boston College and Boston University. The junior leads the Friars in scoring with 25 points (8g, 17a) and is currently riding a 12-game point streak, the longest in the NCAA this year.